In 1905 Alfred Binet and Theodore Simon developed the first modern intelligence test. Since that time we have been debating what “intelligence” is, where it comes from, and how to develop it. Our “Intelligence Quotient” or “IQ” is generally thought of as our linear, analytical intelligence. Initially it was expected that IQ would be a strong predictor of success in careers. In fact it has turned out to be a weak predictor of success. IQ appears to be related to minimum standards to enter a given a profession. But once you have chosen your career, what actually leads to success is far more complicated. Daniel Goleman popularized the phrase “Emotional Intelligence” with the publication of his book by the same title in 1995. In his book, Goleman cites research at Bell Labs that examined star performers, and tried to determine what distinguished them from more average performers. It appeared that star performers had stronger relationship skills than average performers. Harvard Business Review published the results of the Bell Labs study in 1993. Business interest in the study of “Emotional Intelligence” or “EQ” began in earnest. There is a fascinating relationship among these quadrants. Research is showing that EQ begins in the Self Awareness quadrant. The degree to which we are self-aware literally limits our ability to be aware of others, or to manage ourselves. The last skills to develop are our Social Skills, being dependent on the other 3 quadrants. Self-awareness is dependent on listening to feedback. So a willingness to truly hear others is a prerequisite for high EQ. It is interesting that Socrates gave the advice “Know Thyself” approximately 2400 years ago. The historical Buddha (roughly 2500 years ago) made the study of the mind (profound self-knowledge) such an elevated practice that it became a major world religion. So what is the link to Spiritual Intelligence? Dana Zohar, a quantum physicist, gave a lecture at the Science and Consciousness conference in Albuquerque, New Mexico in April 2001. She was working on a new book on Spiritual Intelligence (or “SQ”), and at that time listed 9 characteristics of SQ. The first of Zohar’s points directly echoes the first quadrant of EQ – Self Awareness but goes beyond it to a sense of connection to the universe. 1. Self-Awareness … you know who you really are and you know that you are connected with the whole universe. 2. Vision & Values Led – or Idealism. Children naturally want to serve, and so do we. Vision and values led is definitive of our humanity. 6. Field Independence (Courage)…a term from psychology that means the courage not to adapt, to be independent. 8. The Ability to Re-Frame…put things into a larger context of meaning. (HarperCollins, 1994) co-authored with James Porras. In it they described their in-depth research and their conclusions regarding 18 companies that were unique in their reputation in their industry, their resilience through hard times and their financial success over 50+ years. The central conclusion: truly great companies are Visionary and Values driven. This directly echoes Dr. Zohar’s 2nd characteristic of SQ. In his latest book, “Good to Great: Why Some Companies Make the Leap and Others Don’t,” (HarperCollins 2001) Jim Collins researched 11 companies who made the transition from being good companies to being “great” companies on par with the companies in “Built to Last”. 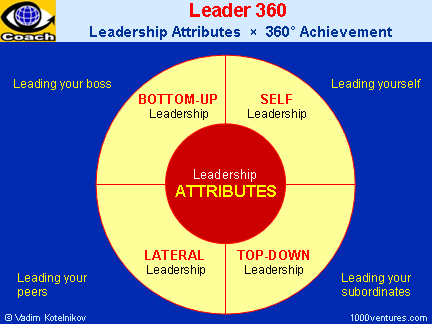 A key finding was that each companyhad what he calls “Level 5 Leadership” (see www.jimcollins.com for more information). As I read about Level 5 leaders I realized that they seemed to demonstrate most or all of the characteristics described as “SQ” by Zohar. In addition, they showed a profound personal humility and a powerful faith that they and their company would prevail in the end, regardless of the difficulties. Self-awareness and cultivating inner strength (or faith) has a solid grounding in all of the major spiritual traditions. Jesus went into the wilderness to meditate and to hear the voice of the infinite creator, as did Abraham, Moses and Mohammed. Buddhists and Hindus practice meditation for these purposes as well. What if EQ and SQ skills became part of the curriculum for all leaders? With solid analysis such as Jim Collins’ leading the way, perhaps that day will soon come. good leadership is indispensable in the business especially with the right policy .